The Governor's Fiscal Year (FY) 2020 budget proposal provides modest increases in funding for public education, human services, and several other important investments. 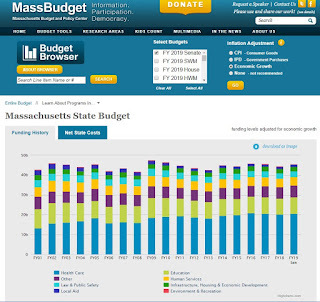 This new funding does not, in many cases, reverse deep cuts imposed across the state budget after the tax cuts of the late 1990s and early 2000s - despite a decade of expansion in the economy. Lost revenue from tax cuts has limited the Commonwealth's ability to adequately fund education, infrastructure, and other building blocks of healthy communities and a strong economy. 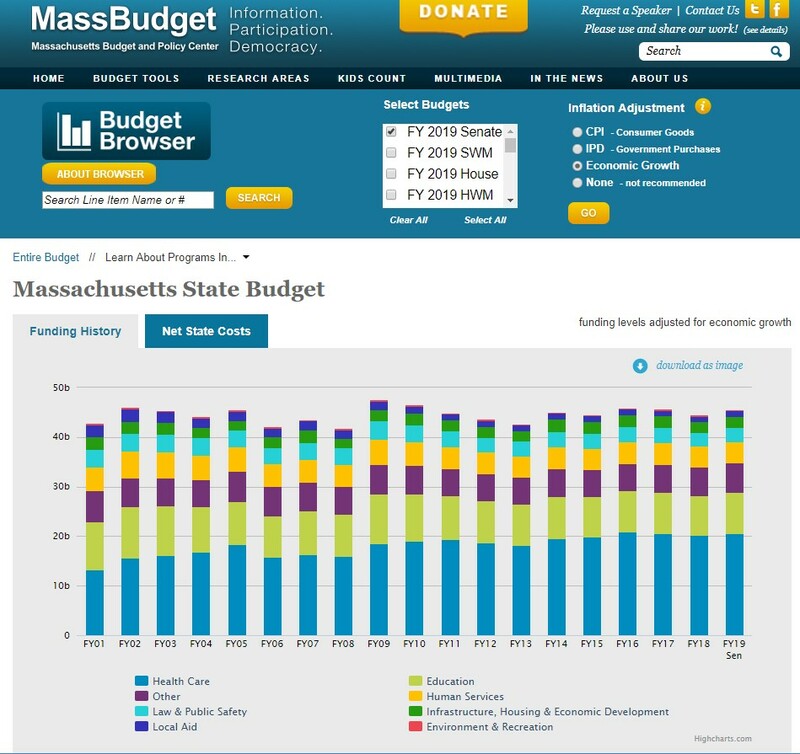 While the Governor's proposal would increase year over year funding for several programs, it provides the same or less funding for programs such as Public Health, Local Aid, Juvenile Justice, Transitional Assistance, and others, according to an analysis by the Massachusetts Budget and Policy Center (MassBudget). The Governor's proposal recommends 16 percent less funding for Early Education and Care compared to FY 2001 (adjusting for inflation). Funding for Local Aid is similarly down 38 percent and Environment and Recreation programs remain 29 percent below 2001 levels. Making the necessary investments in our schools, transportation, housing, and other essential programs will require bold, new revenue sources. Tax revenue growth was unusually strong in FY 2018 and may continue to be strong for most of FY 2019. The Department of Revenue expects that, without policy changes to increase revenue, overall revenue growth will slow markedly in FY 2020 - putting a strain on our capacity to support public programs and invest in infrastructure. While the Governor's FY 2020 budget proposal includes a variety of new and expanded taxes and other revenues, a number of previously-scheduled tax cuts and other revenue-losing policy changes will take a significant bite out of revenue totals in FY 2020 and beyond. Much of the additional revenue proposed by the Governor would come from a variety of consumption taxes, which typically are regressive (meaning people with lower incomes contribute a larger share of their household incomes toward these taxes than do people with higher incomes). Meanwhile, the tax revenue reductions mostly come from progressive revenue sources. Therefore, these proposals do not help turn Massachusetts' upside-down tax system right-side up. The Governor's proposal is accompanied by a plan to overhaul Massachusetts' school funding formula that could help ensure that all schools, especially those in low-income districts, are adequately funded. The plan makes some progress, over a seven-year timeline, to implement the 2015 Foundation Budget Review Commission (FBRC) recommendations related to health insurance, special education, and greater support for low-income and English Language Learner students. However, without substantial, new revenues the Commonwealth can only adopt a moderate plan to implement the FBRC recommendations. The budget proposal includes other notable initiatives. For instance, the Governor proposes creating a trust fund to prevent childhood lead exposure and increasing the "Real Estate Transfer Tax" to invest in climate change adaptation. Further, the Governor proposes new systems for negotiating the cost of drugs used under MassHealth and expands eligibility for low-income elders to qualify for the Medicare Savings Plan.